(a) Explain whether there is a relationship between inflation and unemployment. Should government interfere and reduce inflation and unemployment? Provide real life examples? (b) Using your home country(INDIA) as a case study outline and analyse inflation, unemployment and growth trends. Identify what range of the aggregate supply curve your country is operating in? (c) Explain how monetary policy can influence an economy, including the exchange rate and employment levels? In recent times the nature of the economies has changed significantly. It is evident that the inter connectedness among the nations has increased extensively especially after globalisation. Thus the risks of financial slowdown in one nation can also affect other countries as well due to increased financial connectivity within the nations. The global recession of 2008-09 created an extensive impact in every economy due to such interconnectivity. It is known that there are various factors that affect the growth and development of an economy and these factors can also be referred as the indicators of the performance of an economy. Such factors can include the inflation rate, unemployment rate, GDP growth rate, National output, per capital income etc. These factors can indicate how well an economy is performing. The government also implements various measures in terms of fiscal and monetary policy for improving the condition of the economy (Colander, 2013). The main aim of this essay is to indicate the relationship between various indicators and the measures that are taken by government to improve the economic condition. Inflation and unemployment are two economic performance indicators of an economy. Inflation can be referred as the increase in general price level of an economy. On the other hand, unemployment is the increase in the percentage of people who are looking for jobs but they are not getting any. Thus when people are actively seeking work but are still without work are unemployed (Hubbard and O'Brien, 2013). The increase in the percentage of unemployed people leads to increase in the unemployment rate. Thus it can be said that the inflation and unemployment are two very important economic indicators. In case of inflation, it can be said that it is undesirable for an economy. Thus the government takes measures to control the inflation in an economy. High inflation is socially undesirable as it increases the price level of goods and services and general population faces difficulties (Layton, Tucker and Robinson, 2002). On the other hand unemployment is also socially undesirable as more people will be out of work and it increases the burden on the society and reduces output (Hubbard and O'Brien, 2013). It is evident that there is a trade-off among the inflation and unemployment. That means there is a negative relationship between the inflation and unemployment. 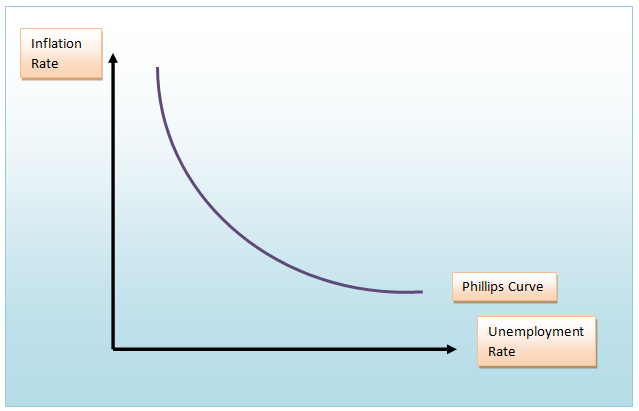 The inverse relation between the two factors is represented by the Phillips curve. Thus it can be said that when the inflation rate increases, the unemployment rate falls. The locus of various combinations of the inflation rate and their corresponding unemployment rates in an economy gives the Phillips curve (Krugman and Wells, 2013). Here it can be said that, the negative relationship between the two factors can be seen in the short-run. Such relationship is not proved to be true in the long-run. In the following diagram, the relationship between inflation and unemployment in the short-run or the Phillips curve is shown. So, it is can be said that unemployment can be reduced in an economy if the government implements inflationary policies. So inflation is not absolutely undesirable in an economy. It is known that there are basically two types of inflation that can be seen in an economy. They are demand pull and cost push inflation. In case of demand pull inflation, the aggregate demand of an economy increases and thus there is a shift of the aggregate demand curve to rightwards. This increases the price level and the output level also increases in the economy (Mankiw, 2013). Thus the firms hire more workers for the production process or catering to the increased aggregate demand and it leads to lower unemployment rate. In the following diagram, the impact of demand pull inflation can be shown (Layton, Tucker and Robinson, 2002). According to Milton Friedman, the Phillips curve is only valid in the short-run. Thus in the long run, the inflationary policy will not address the unemployment issue of the economy. It is identified that inflation and unemployment are both undesirable in the society. But there is a trade-off between the two factors that means an increase in one factor can lead to the reduction of the other. So, it is very important to take appropriate measures to maintain the balance between the two factors and maximise the social and economic welfare in an economy. Thus government intervention is necessary for implementation of various policies and procedures in order to increase the employment level of an economy and also maintain the inflation at a tolerable leve (This is Money, 2015)l. The government can intervene in the economy with the help of fiscal and monetary policies. The fiscal instruments include the tax rate and the government expenditure. On the other hand the monetary measures include the money supply and interest rates. These can be used in order to increase or lower the inflation and unemployment rate. Here several examples can be given that represents the negative relationship between the inflation rate and the unemployment rate. In the following diagram, the trend of inflation and unemployment can be shown. It can be seen that, when the inflation rate has increased the unemployment rate has fallen in the economy. There can be exceptions to the theory as well. In 2011, it is seen that the inflation rate and the unemployment rate has increased and in 2012, both inflation rate and unemployment rate has reduced. The government intervention in the economy can be referred as one of the measures that helped in reducing both unemployment rate and the inflation rate in the economy. In each and every economy the inflation and unemployment is considered as two major indicators of the performance of an economy. These factors can also affect the growth level of the economy. Thus it can be said that there is a relationship between the inflation rate, unemployment rate and the growth rate. Here the inflation, unemployment and growth trends in India in the past few years can be shown and relationship can be established. The inflation rate is the general increase of the price level in an economy. It is known that, India is one of the emerging economies in the world and the interconnectedness of the country with other country is also significant. India is connected with various countries in terms of trade relations or foreign direct investment. Thus the shortage or surplus of a product leads to rising prices and thus the inflation in the economy. In December 2014, the inflation rate was recorded at 5. In 2012 the inflation rate was 8.98 and it was at all time high rates of 11.16% in November 2013. The Wholesale Price Index (WPI) is the main measure that is used in India for inflation. But there are also the debate regarding the Consumer Price Index (CPI) to be a better measure of presenting the inflation in an economy. The most important categories that are included in CPI are tobacco, food and beverages. Other products are housing, fuel and light, transport and communication, clothing bedding and footwear, medical care, and education. In the following table various measures of inflation are given. In the following diagram the inflation rate of India from 1959 to 2013 is shown. It is seen that the fluctuation in the inflation rate is high during earlier decades. In recent decade, the fluctuation in the price level is minimised and the inflation rate is maintained at a lower level. In 2009, the CPI was as high as 14.97%. the main reason for such inflation rate can be referred as the global financial recession during that time (Media, 2015). Now the unemployment trend in India can be evaluated. It is known that the unemployment rate refers to the percentage of people who are willing to do a job and are also looking for a job but are not receiving any employment opportunities in the market. Unemployment is also undesirable in an economy. It is known that the population density in India is very high and thus it is very important to generate employment opportunity for the employees. The unemployment rate in India averaged 7.58% from 1983 until 2012. The unemployment rate in India was 6.30 % in 2011. It decreased to 5.20% in 2012. All time high unemployment rate in India was seen in 2009 when it reached 9.40% (Statista, 2015). Such trend was seen due to the global financial crisis at that time. The ministry of Labour and Unemployment mainly reports the unemployment rate in the country (Tradingeconomics.com, 2015). In the following graph the unemployment rate in India is shown from 2000 to 2014. In the above diagram, it can be seen that the unemployment rate in the country increased steadily from 2000 till 2006. After that the unemployment rate fell for the next two years and after that a sharp increase was seen in the unemployment rate from 2008 to 2010. After 2010, there was significant reduction in the unemployment rate in the economy. In the following table, data on various factors related to unemployment rate is shown. Here it can be said that the unemployment rate in recent years has declined significantly due to increased government intervention in the economy. It is evident that the government has taken measures in the economy for providing better job opportunities. On the other hand the expansion of various industries especially in the private sector has also provided extensive job opportunities for the job-seekers. It is known that there is a negative relationship between inflation and unemployment. Thus the trend of these two factors for India can be identified. In the following table the data on inflation and unemployment for India is shown for the year 2002-2013. Now the trend line for inflation and unemployment can be shown. In the above diagram, it can be seen that during 2002-2007, the Phillips curve relationship is true as the unemployment rate has fallen when the inflation rate has increased. But after 2008, the Phillips relationship is not maintained and inflation rate and the unemployment rate has increased and reduced at the same time. Now the growth trend that is seen in India in the past few decades can be discussed. The growth rate refers to the increasing rate of GDP in an economy. It is evident that in the third quarter of 2014, the GDP growth rate in India was 5.30. The average annual growth rate of India from 1951 to 2014 was 5.82. The growth rate reached all time high in the first quarter of 2010 when it reached 11.40%. The Ministry of Statistics and Programme Implementation (MOSPI) reports on the GDP annual growth rate of India. In the following diagram, the growth rate of India can be shown from 2000 to 2014. From the diagram it is seen that the GDP growth rate of India has fluctuated in various time period. The growth rate has increased sharply in 2005 and it continued to grow till 2008. After that there is a decline in the growth rate but after that it has increased and again fell around the year 2012. Now in the following table the data on inflation, unemployment and the growth rate can be presented. The trend line for these three economic indicators can be shown in the following diagram for the year 2002-2013 in India. The aggregate supply curve can be referred as the total supply of goods and services that is supplied by the producers in an economy at various price levels. Thus the aggregate supply curve is the locus of the quantity of total goods or services that are supplied by the producers and the corresponding price levels. There are basically three ranges of the aggregate supply curve where it operates. These three ranges are Keynesian, Intermediate and classical (Economicsonline.co.uk, 2015). In the following diagram, the three ranges of aggregate supply curve can be shown. In the diagram the three ranges of aggregate supply curve is shown. In the above diagram, it can be seen that when the growth rate has reduced the inflation rate has also reduced and when the growth rate has increased, the inflation rate has also increased. Thus there is a positive relationship between inflation and GDP growth rate of India and thus India is operating in the intermediate range of the aggregate supply curve where the relationship between the price level and real GDP rate is positive. The monetary policy is one of the most effective instruments of government that is used in order to implement changes in various economic factors in the nation. Though monetary policy measure, the monetary authority of a country controls the supply of money in the economy in order to maintain stability and for inducing economic growth in the nation. The monetary policy usually targeted towards the interest rate and the inflation rate for increasing the growth and stability in the economy. The monetary policy can be either expansionary or it can be contractionary. The expansionary monetary policy increases the supply of money in the economy and resultant impact is seen. On the other hand, the contractionary monetary policy lowers the money supply in the economy and the resultant impact is achieved. The expansionary monetary policy basically increases the money supply in the economy. The expansionary monetary policy is usually implemented in order to stabilise the unemployment rate during recession by lowering the rate of interest. It is also evident that increase in the money supply leads to increase in the inflation rate in an economy due to reduction in the value of money. Thus increased money supply also increases inflation. But it is known that higher inflation rate reduces the unemployment rate. Thus expansionary monetary policy can also reduce unemployment rate in an economy by increasing the inflation level by increasing money supply in the economy. An expansionary monetary policy increases the price of bonds, higher investment in capital due to lower interest rate. The exchange rates are also affected by the expansionary monetary policy. As a result of the expansionary monetary policy, the demand for foreign currency increases and the demand for domestic currency fall as the value of money of the domestic country increases. On the other hand the contractionary monetary policy is implemented by lowering the money supply in the economy. The government can implement contractionary monetary policy by using following measures. The government can sell the securities in open market, increase the reserve requirements in the banks or by raising the federal discount rate. Thus in this policy measure the rate of interest rises in the economy and the investment falls. This lowers the inflation rate in the economy. The supply of bonds in the market is increased and the bonds are bought by the foreign buyers. Thus the demand for the domestic currency increases and the demand for the foreign currency reduces in the market. Thus the exchange rate of the domestic currency will appreciate and the exchange rate of the foreign currency will depreciate in the market. So it can be said that the contractionary monetary policy will increase the interest rate, decrease the bond price, reduce the investment on capital, appreciate the doemstuc currency and depreciate the foreign currency. Thus it can be said that the monetary policy can significantly affect the economy by impacting various economic indicators in the economy. The monetary policy is implemented by the monetary authorities in a nation and it rests on the relationship between the total supply of money and the rate of interest. The monetary policy can also affect the growth rate in the economy (Federalreserve.gov, 2015). In certain scenario, the monetary policy can be ineffective to address the issues in the economy. For example, when the inflation is triggered by high wage demand and it can also increase the cost of the firms. In such scenario, the monetary policy cannot be credible. Open market operations are one of the effective tools that are used in case of monetary policy implementation. In various countries, the government implements measures to get desirable results in the economy. For example, during the global financial crisis, the government of various countries took several measures in terms of monetary policies for attaining stability in the economy. The Federal Open Market Committee established a near-zero range of target for the rate of federal funds (Federalreserve.gov, 2015). The Federal Reserve also tried to hold the long-term securities in the market and a downward pressure was given on the interest rates. Thus expansionary monetary policy was implemented by various countries for attaining the stability in the economy after the global financial crisis. In conclusion, it can be said that in recent times there has been increased competition among the organisations, especially at the global level. Such competition is also seen among the nations. It is evident that there are developed as well as developing countries. Various developing countries like India and China are significantly emerging in the economy by high performance and growth rate. Thus it is very important that the government of various nations take appropriate measures that can help in increasing the economic performance of a nation in terms of the inflation rate, unemployment rate, exchange rate, growth rate etc. In this essay, the relationship between the inflation and unemployment is presented. In case of India the growth rate, the inflation rate and the unemployment rate are presented and the influence of monetary policy on various indicators is also explained. Colander, D. (2013). Macroeconomics. New York, NY: McGraw-Hill/Irwin. Data.worldbank.org, (2015). GDP growth (annual %) | Data | Table. [online] Available at: https://data.worldbank.org/indicator/NY.GDP.MKTP.KD.ZG?page=2 [Accessed 17 Jan. 2015]. Economicsonline.co.uk, (2015). Aggregate supply. [online] Available at: https://www.economicsonline.co.uk/Managing_the_economy/Aggregate+supply.html [Accessed 17 Jan. 2015]. Federalreserve.gov, (2015). FRB: Open Market Operations. [online] Available at: https://www.federalreserve.gov/monetarypolicy/openmarket.htm [Accessed 17 Jan. 2015]. Hubbard, R. and O'Brien, A. (2013). Macroeconomics. Boston: Pearson. Indexmundi.com, (2015). India - Unemployment rate - Historical Data Graphs per Year. [online] Available at: https://www.indexmundi.com/g/g.aspx?c=in&v=74 [Accessed 17 Jan. 2015]. Krugman, P. and Wells, R. (2013). Macroeconomics. New York, NY: Worth Publishers. Layton, A., Tucker, I. and Robinson, T. (2002). Economics for today. Southbank, Vic. : Thomson. Mankiw, N. (2013). Macroeconomics. New York, NY: Worth. Media, T. (2015). Historic inflation India – historic CPI inflation India. [online] Inflation.eu. Available at: https://www.inflation.eu/inflation-rates/india/historic-inflation/cpi-inflation-india.aspx [Accessed 17 Jan. 2015]. Media, T. (2015). Inflation in Great Britain - current and historic British consumer price index (CPI). [online] Global-rates.com. Available at: https://www.global-rates.com/economic-indicators/inflation/consumer-prices/cpi/great-britain.aspx [Accessed 17 Jan. 2015]. Statista, (2015). India - Unemployment rate 2013 | Statistic. [online] Available at: https://www.statista.com/statistics/271330/unemployment-rate-in-india/ [Accessed 17 Jan. 2015]. This is Money, (2015). Economy tables: GDP, interest rates, inflation history, unemployment. [online] Available at: https://www.thisismoney.co.uk/money/news/article-1586103/Inflation-Interest-rates-Economic-growth-Unemployment-Latest-statistics.html [Accessed 17 Jan. 2015]. Tradingeconomics.com, (2015). India GDP Annual Growth Rate | 1951-2015 | Data | Chart | Calendar. [online] Available at: https://www.tradingeconomics.com/india/gdp-growth-annual [Accessed 17 Jan. 2015]. Tradingeconomics.com, (2015). India Inflation Rate | 2012-2015 | Data | Chart | Calendar | Forecast. [online] Available at: https://www.tradingeconomics.com/india/inflation-cpi [Accessed 17 Jan. 2015]. Tradingeconomics.com, (2015). United Kingdom Unemployment Rate | 1971-2015 | Data | Chart | Calendar. [online] Available at: https://www.tradingeconomics.com/united-kingdom/unemployment-rate [Accessed 17 Jan. 2015].